Home‘Fiddler’ 2017 breaks all SCP records – L’Chaim! This run just keeps surpassing itself. 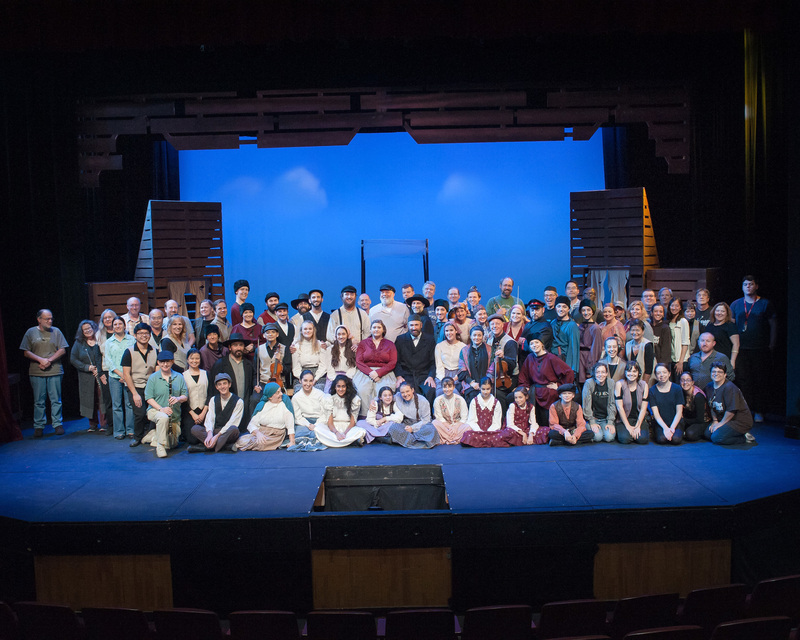 The Sunnyvale Community Players production of Fiddler on the Roof continues to receive not one, but two standing ovations every performance, and as of 29 September 2017 (one quarter of the way through its penultimate weekend), the run completely sold out. As written in the background pieces – promising cheers and tears, tech week chronicles from the pit, and why his run – this production means a great deal to everyone involved with the show. Rather than rehashing the background already discussed at length, this article attempts to provide some more video insights into this heartfelt journey. Although some of the videos that follow have appeared in the aforementioned articles, not all of them have, and they tell quite a story. And now, given the tickets are all sold, they also allow many who wouldn’t otherwise have the opportunity to experience a small whiff of this production. They also allow the many who have seen it (or lived it) to enjoy another look at some key moments. This first video is the most recent and wasn’t planned. During warm-ups before the first performance of the fateful penultimate weekend, the orchestra had just finished polishing a particularly difficult portion of the John Williams piece that they play each intermission. Instead of stopping, they continued into the truly magical portion of this work. Co-Director, Steve Shapiro, did a little quick thinking, pulling out his trusty iPhone and capturing this impromptu display. The abounding comradery and admiration within this theatre family are quite evident. 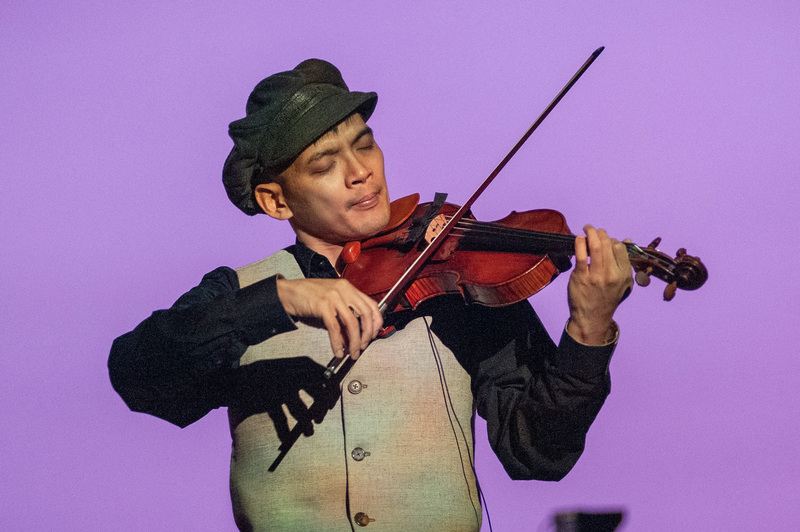 The next video hearkens back to the beginning of the rehearsal period for this production in a promotional sequence interspersing early cast music rehearsals with pieces of Eric Sun practicing his violin cadenza. Piano accompaniment is provided by Benjamin Belew. The backstory of how Eric began his journey to master this challenging work can be found in the other A Good Reed Review articles linked above, and of course in the show’s program if you are lucky enough to have secured a ticket to witness this production in person. This next video is from the first time the orchestra and cast met at Sitzprobe #1. Note that this was also the first time the orchestra members met each other in rehearsal. Up until this point, cast rehearsals were conducted with either a computerized rehearsal track, or piano only, and the orchestra members practiced their parts alone, in the privacy of their personal spaces. The pictures in the next video are still shots of the stage action from scenes throughout the show during tech rehearsals, and the audio is from our recording session of the John Williams mini-symphony on the second night of tech. That recording session was part of the background for an upcoming feature story in a major national magazine. The next several videos are also from tech week showing the cast (accompanied by the orchestra) in action. Much of the news focus for this production has surrounded Eric Sun, and for good reason. This feature story with NBC Bay Area was filmed the first Sunday of the run, and the piece aired two days later telling how Eric reenergized his music to connect so many others in the community while he still could. Many of the people involved with this production have done the show before in various capacities, but for all involved, this run is by far the most memorable and poignant, and audiences agree. The show ends 8 October 2017, and for everyone involved, this journey has created a lifetime of memories. L’Chaim! The New Yorker magazine published an exquisite profile of Eric Sun in their 1 January 2018 edition. The online version of the article can be found here: A Tech Pioneer’s Final Unexpected Act.